Phantasy Star Online for the GameCube is no longer hosted by Sega. In March of 2007, Sega terminated all GameCube servers world-wide. 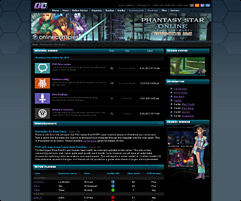 Over the years, new server software was developed by members of the PSO community, allowing the game to be played online independently from Sega. As such, OnlineConsoles strives to run a 100% legit (cheat free) server environment for Phantasy Star Online Episode 1&2. To maintain the integrity of our community, the servers and forums for PSO at OnlineConsoles require special access. New players must first meet a minimum set of requirements and then apply for PSO Access. How can I gain Access to play? What is the PSO experience like at OnlineConsoles? "But, I need help getting PSO online to play on other servers." How active are the PSO servers at OC? 1. How can I gain Access to play? 2. What is the PSO experience like at OnlineConsoles? OnlineConsoles.com's server is designed to be as historically accurate as possible. When you log on, you are greeted with the same "Minhiro" community message that was displayed on Sega's PSO servers. When Phantasy Star Online first launched on the Dreamcast, it wasn't long before it was overun by cheating. Users would duplicate rare in-game items and distribute them to unknowing players. A variety of codes were also used to harrass users, and at the very worst, corrupt your entire PSO save forcing you to start over. Throughout the course of PSO's lifespan those who wanted to play the game legitimatly, were forced to hide from the main playerbase by joining empty lobbies and constantly passwording hosted game rooms. We aim to provide a fun place to play, which mirrors what Sega originally intended for the game, without the negative effects of cheating. Instead of strictly policing the servers, we are encouraging users to take it upon themselves to maintain the Legit nature of this community. It is recommended that users avoid trading items with other users. By finding items in-game and helping each other as a team, it adds to the experience and also prevents the flow of duped items. The PSO forums are read only for the public, but once you gain access, the entire design changes to a new look and feel. 3. How active are the PSO servers at OC? We do our best to provide the necessary tools to facilitate online game sessions, such as forums and hosted servers. It can be difficult to keep any online game active after it has passed its peak in the mainstream market. To play online usually requires rolling up your sleeves and getting involved with the community, such as posting in a special PSO "Hunters Lobby" forum to get peoples attention and schedule a time to play. As long as you are patient, you will find people to play with. 4. What about other servers? Due to PSO's sordid history with cheating, we are unable to help someone gain access to a server that may support cheating. Also, from a forum organization standpoint we want to keep all of our PSO discussions focused in one location, rather than being split into 2 streams. This is a very rare and special case with regards to PSO and it would not happen with any other game. We try our best to help any and all users get online with their consoles, but for PSO we have decided to restrict all discussions to our private community forums.